We love Los Cabos, especially this time of year (who couldn't use a margarita with salt under the sun to cope with the holiday frenzy?). And we especially love it when the Mexican resort town's toniest resorts are offering appealing deals such as those outlined below. At the boutique Small Luxury Hotel Casa Natalia, a "Winter Getaway Package" runs from January 6 through March, and includes five nights for the price of four. Included in the winter package-- priced at just $1,890--is daily breakfast served on your private terrace and a tasting dinner for two. Honeymooners seeking a seriously luxurious getaway at a reasonable price should look to Esperanza and its "Luna del Miel Honeymoon Package" available January 2 through June 15. The romance-infused package (priced at $5,264) includes four nights in an Oceanview Casita with infinity-edge hot tub, private round-trip airport transfers, daily breakfast for two, one dinner for two plus a two-hour couples' spa treatment. Another enticing option for those needing a quick escape is offered by Las Ventanas al Paraiso, one of our favorite resorts (pictured) in Mexico. The Rosewood resort's Runway to Paradise Package includes three nights in an Oceanview Junior Suite, private round-trip airport transfers, welcome margaritas, daily breakfast for two, one massage per person, and a complimentary Las Ventanas Air Meal upon departure. From Jan 2 through May 26, the three-night deal is priced at $4,909 inclusive of all taxes and fees. 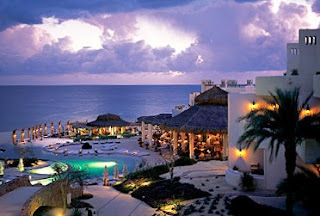 Last but not least is One&Only Palmilla, with its seven-night "One&Only Moments Package" for two. This week-long indulgence includes Champagne upon arrival, private roundtrip airport transfers, daily breakfast and lunch, plus dinner for two on five of the seven nights, (one at Jean-George's MARKET, another served on the beach). Also included is an extended spa experience complete with a couple's yoga session, facials, massages, a wellness lunch and more; two rounds of golf at Palmilla Golf Club; a Hummer Adventure Tour; a horseback tour of a lagoon; cooking classes and lunch featuring local Baja wines. The seven-night nearly all-inclusive package starts at $9,459 and is available Jan 3 through May 13. For more information or to book, contact The Elite Travel Gal.